ThThe Electrostimulator 4c.Pro is a four channel percutaneous electroacupuncture stimulator. All four output channels will deliver the stronger type, classical milliampere strength electrical current. 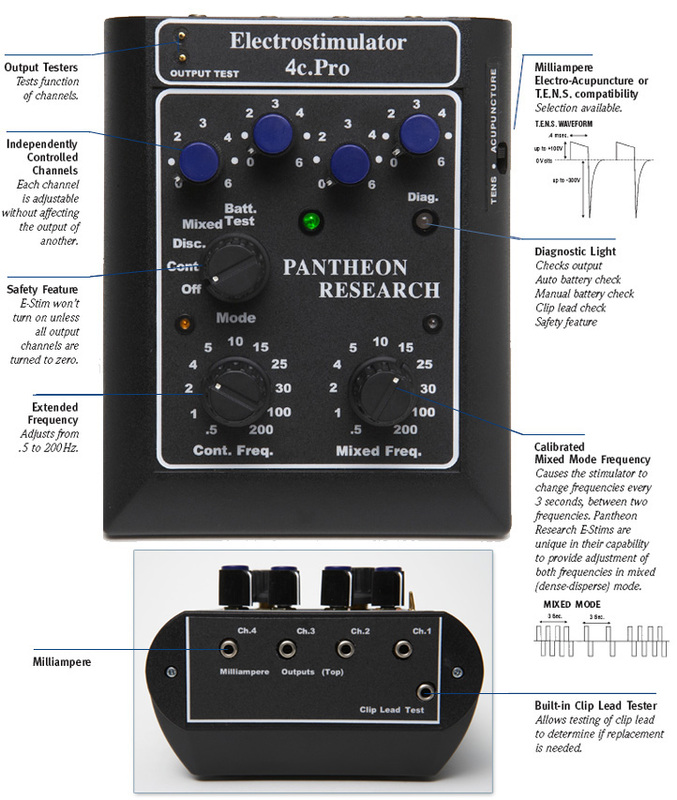 Pantheon Research uses an exclusive electrical waveform that is considered the best type for maximum physiological response of a beneficial nature, the symmetrical biphasic waveform. All of our electroacupuncture stimulators are frequency calibrated to an accuracy within 99.94%. These are American-manufactured to high professional and scientific standards, and come with a full two-year warranty. Includes 2 alligator clips and 2 microclips. hlators are frequency calibrated to an accuracy within 99.94%. These are American-manufactured to high professional and scientific standards, and come with a full two-year warranty. No-Shock Safety Feature Yes. 4c.Pro will not turn ON unless all outputs are turned OFF. Safety Mechanism All outlets must be turned OFF before the power can be turned ON. I just acquired 2 4Pro and the devices were delivered in a timely manner. I worked with John who made sure the units were delivered with leads that were customized to my specification. The device s were well-built and worked like a charm. Delivery of the product is a bit slow but worth the wait. Easy to use and adjust. My patients love it too!